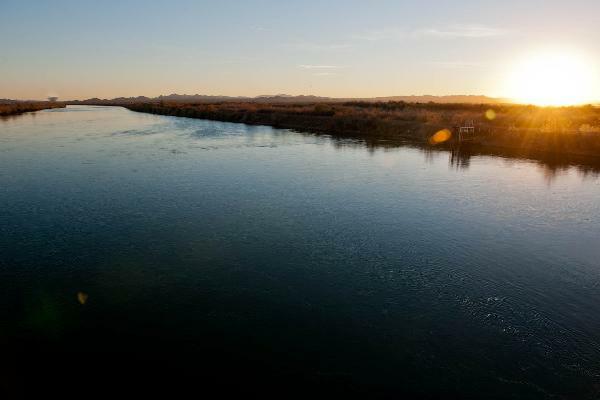 PHOENIX (CN) — A small Indian reservation that’s become a major economic force in the desert south of Phoenix has sued the Central Arizona Water Conservation District for refusing to deliver what the tribe considers its annual allotment from the Colorado River. The Ak-Chin Indian Community, in the Santa Cruz Valley some 50 miles south of Phoenix, was granted 46,600 acres in 1912 under President William Howard Taft. When Anglo farmers complained the tribe’s land was reduced by more than half in 1913, to 22,000 acres. After numerous changes in federal Indian policy, the Ak-Chin became a federally recognized tribe in 1961. Like most tribes shunted and confined to small pieces of their traditional lands, they lived in poverty. Today the tribe has about 770 enrolled members. Ak-Chin means “mouth of the wash” in the tribe’s O’odham language. The O’odham, formerly known as Papago, were agrarian people even before the Spanish and Anglos invaded. They farmed at the mouth of desert washes, where, if they were lucky, winter rains provided enough water for subsistence farming. The farm was their primary economic base in the early decades of the reservation, and the Ak-Chin still operate a 15,000-acre commercial farm on their land, much of it planted with cotton. In 1984, after years of negotiations and litigation, the tribe was granted an annual water allotment of 75,000 acre-feet from the Colorado River Project, a giant system that delivers water from a reservoir near Parker across Arizona as far south as Tucson. In wet years, when water is available, the Ak-Chin can order up another 10,000 acre-feet. One acre-foot of water, enough to cover one acre one foot deep, is generally assumed to be enough water to supply a suburban family of four for a year. But in arid Arizona, where people are accustomed to water conservation, a family may use only one-quarter or one-half an acre-foot a year. The tribe says the extra 4,000 acre feet is to cover “transmission losses” — leaks and evaporation between the Central Arizona Project and the delivery point—problems which have been acknowledged since the Central Arizona Project was under construction, and from which all of its recipients suffer. The Water Conservation District said in a statement that the language of the Ak-Chin Water Rights Settlement Act does not obligate it to deliver the excess water. “This is a long-standing dispute over the interpretation of ambiguous language in a water rights settlement,” the district’s General Counsel Jay Johnson said in the statement. “This is not about diminishing anyone’s rights or withholding water, but is about a desire to collaboratively resolve and have clarity on each party’s respective rights by a neutral third party, the court. Ak-Chin is represented by Catherine Munson with Kilpatrick Townsend and Stockton in Washington, D.C.
“This water is more than an asset, it is the lifeblood of the Ak-Chin Indian Community,” tribal Chairman Robert Miguel said in the statement. “Without it, we cannot raise the crops we need to support Ak-Chin Farms and the 84 tribal employees who work there. Left unsaid in the March 28 lawsuit, and the statements from the tribe and the water district, is that more than the farm hangs upon the water supply. The tribe’s economic base began changing when it established a casino with Harrah’s in 1994. Close enough to Phoenix to draw crowds, by 2011 Harrah’s Ak-Chin Casino was a major economic contributor to Pinal County. In a $20 million expansion in 2012, the casino doubled its hotel capacity to 300 rooms, with five restaurants, conference spaces, an entertainment venue, bingo hall, bowling alley and movie theaters. The tribe also purchased the Phoenix Regional airport and renamed it the Ak-Chin Regional Airport and bought the Royal Dunes golf course and renamed it the Ak-Chin Southern Dunes Golf Club. The lawsuit states that the 15,000-acre farm has been “a central economic enterprise for Ak-Chin since the 1960s,” the complaint states. It adds: “Ak-Chin has incurred substantial long-term obligations in reliance on its statutory and contractual rights to receive water from the United States, including a 100-year lease to Del Webb Corporation and other leases.” Del Webb is a real estate developer, now known as PulteGroup. It has built several casinos. The Ak-Chin seek a declaratory judgment of their water rights and a permanent injunction granting them the extra 4,000 acre-feet.